AHLS for Chemical Burns & Toxic Products of Combustion Course is a 4-hour course, derived from the AHLS Provider course. The specialized course teaches healthcare professionals to medically manage chemical burns and toxic inhalation injuries, including carbon monoxide and cyanide poisoning. Course consists of didactic lecture and tabletop exercises. No exams or pre-requisites are required. 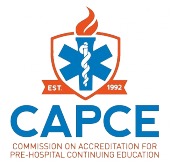 CAPCE (Commission on Accreditation for Pre-hospital Continuing Education) represents only that its accredited programs have met CAPCE’s standards for accreditation. These standards require sound educational offerings determined by a review of its objectives, teaching plan, faculty, and program evaluation processes. CAPCE does not endorse or support the actual teachings, opinions or material content as presented by the speaker(s) and/or sponsoring organization. CAPCE accreditation does not represent that the content conforms to any national, state or local standard or best practice of any nature. No student shall have any cause of action against CAPCE based on the accreditation of the material. The American Academy of Clinical Toxicology (AACT) is an international multi-disciplinary organization whose goal is advancing the diagnosis and treatment of poisoned patients. AACT is the co-presenter of AHLS. AACT members serve on the AHLS Scientific Advisory Committee and Administrative Policy Committee.